Yeah, but: Don't start if there's somewhere you need to be. The Long Version: One of the problems with Mac OSX 10.7 is that it broke the older non-native software that had previously been supported by Apple's Rosetta translator. While that OS upgrade's scheduled for a "cold, dead hands" date for my iMac, I have moved my Macbook Air to the new system. The reason why my iMac will remain frozen is the same reason why I needed a new game to play on my Air – Delta Tao's Spaceward Ho!, the stalwart of galactic conquest that single-handedly delayed System 7's release, never made the jump to the Intel architecture and can't run without Rosetta. But never let it be said that I'm up-to-date. My new game of choice is Bejeweled 3, and while it's a current release the underlying game is quite old. I was playing Jeweltoy, the non-networked version, almost a decade ago. According to Wikipedia, its lineage can be traced even farther back to the Russian "match three" game Shariki, which was released for DOS in 1994. There are many different versions of the same basic game to be found now, but Bejewelled is the best one that I've played. The basic idea is that game pieces can be moved one step horizontally or vertically if that creates a match of three or more pieces of the same shape and colour. Matching three makes them disappear and cascades new pieces into their place, while matching more creates special game pieces that have more dramatic effects. The basic gameplay is quite simple, but the execution benefits from sophistication and forethought. 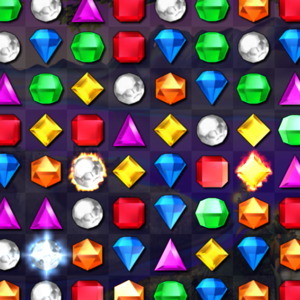 Bejeweled can be played in both timed and untimed games, as well as in subgames with special rules and gimmicks. I prefer the untimed games, and typically play the "Classic" mode. This creates arrangements of increasing difficulty, and ends when there are no more moves possible. There's also the (new) "Zen" mode that will always have at least one move available, and so offers unending play. But aside from having nothing at all to do with Zen, or any other known form of Buddism, the game is still interrupted by some decidedly non-placid animations each time the levels change. In fact, the whole "next level" thing defeats the uninterrupted play idea. There are times when I just want to hear the stones clicking together, but for that this new mode is a disappointment. Playing the timed modes provide more of a challenge and acutely tests reaction speed more than longer-term strategy. This mode benefits the most from being able to click-and-drag to swap positions, which is faster than the more contemplative click-and-click technique. I generally prefer games that progress interestingly toward my inevitable victory, which is why I still enjoy Spaceward Ho! after twenty years, but there's a lot to be said for getting more of a rush from a computer game. The timed modes do this quite well. I was hesitant about Bejewled's $20 price tag – after all, this isn't The Sims, nor is it a feature film. But it's almost as addictive as the former, if not as involved, and remains entertaining long after a movie has devolved to basic cable. But more than the money, it also costs me several hours of sleep each week, and after a long session I see its patterns every time I close my eyes. 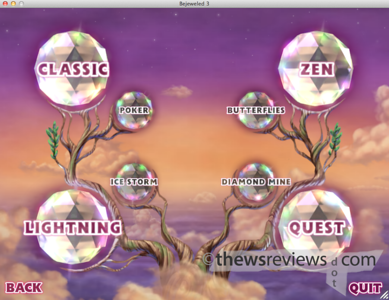 Even with the relatively steep price, it's hard not to recommend Bejeweled 3 to anyone who likes puzzle games.